I made breakfast this weekend and wanted to make a couple pancakes for myself. (Lloyd won’t eat them, and I don’t blame him. I don’t like pancakes in general, unless I’m making them. It’s not that they taste different, it’s the ownership. “I made this thing I’m not so fond of, therefore I am fond of it.”) I needed room for my pancake, so I took a big plate, and since I was going to have more food, I gave Lloyd more eggs. I think it’s funny that you posted about scrambled eggs, because I did too. Isn’t using a smaller plate supposed to be a portion-control technique? 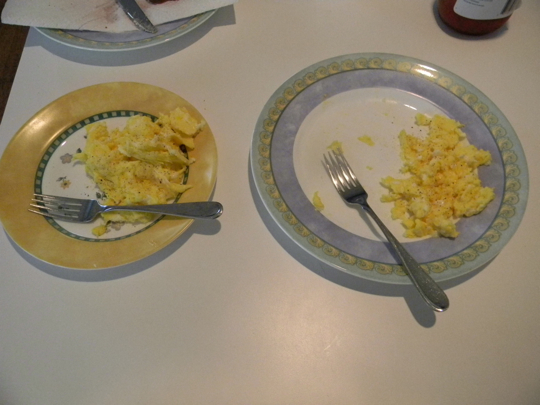 Except you’re supposed to put less eggs on the smaller plate. I also heard about a guy who decided to always use a tiny fork when eating. He said it slowed him down and made him eat less. Are the forks of differing lengths also? I don’t know…. what do you think?